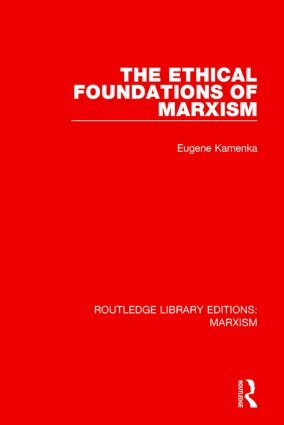 The Ethical Foundations of Marxism, first published in 1962 and corrected and revised for a 1972 edition, examines carefully and critically the origin, precise nature and subsequent role of Marx’s ethical beliefs. Drawing freely on Marx’s still largely untranslated philosophical works and drafts the author elicits the ethical presuppositions with which Marx began. He then examines the intellectual development that made Marx a Communist and seeks to clarify the place of Marx’s ethic in his mature, ‘materialist’ work. Professor Kamenka distinguishes sharply between the critical, ethical views of Marx and the inept, conventional applications of his doctrine by Engels. He appraises the ‘ethics’ of the Communist Party and traces the development of the moral and legal theory in the Soviet Union. He concludes by subjecting Marxism as a whole to a radical, ethical and philosophical criticism for which Marx himself laid some of the foundations. Part 1. The Primitive Ethic of Karl Marx 1. The Philosophy of the Concept 2. The Free Individual 3. The Natural Law of Freedom 4. The ‘Truly Human’ Society Part 2. Karl Marx’s Road to Communism 5. The New Social Dialectic 6. The Critique of Politics 7. The Critique of Economics 8. Communism and the Complete, Unalienated Man Part 3. Critical Resume: Ethics and the Young Marx 9. Ethics: Positive or Normative? 10. The Rejection of Moralism, of ‘Rights’ and of Normative Law 11. Ethics and the ‘Truly Human’ Society Part 4. Ethics and the Mature Marx 12. The New Edifice: Historical Materialism and the Rejection of ‘Philosophy’ 13. The Materialist Interpretation of History and Marx’s Critique of Moralities 14. Historical Materialism and the Overcoming of Alienation Part 5. Communism and Ethics 15. Ethics and the Communist Party 16. Law and Morality in Soviet Society. Conclusions. Ethics and the Foundations of Marxism.